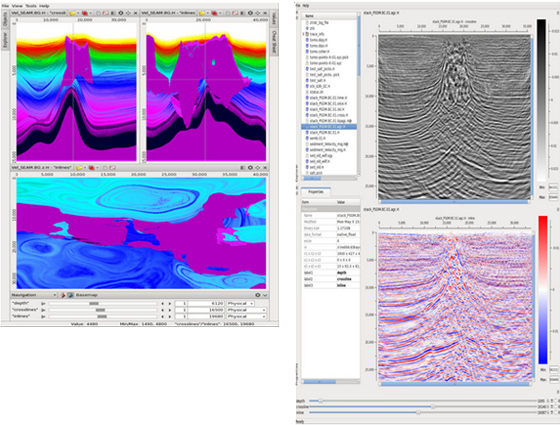 Kirchhoff methods are widely recognized as one of the most comprehensive and flexible methods of imaging prestack 3-D seismic data. 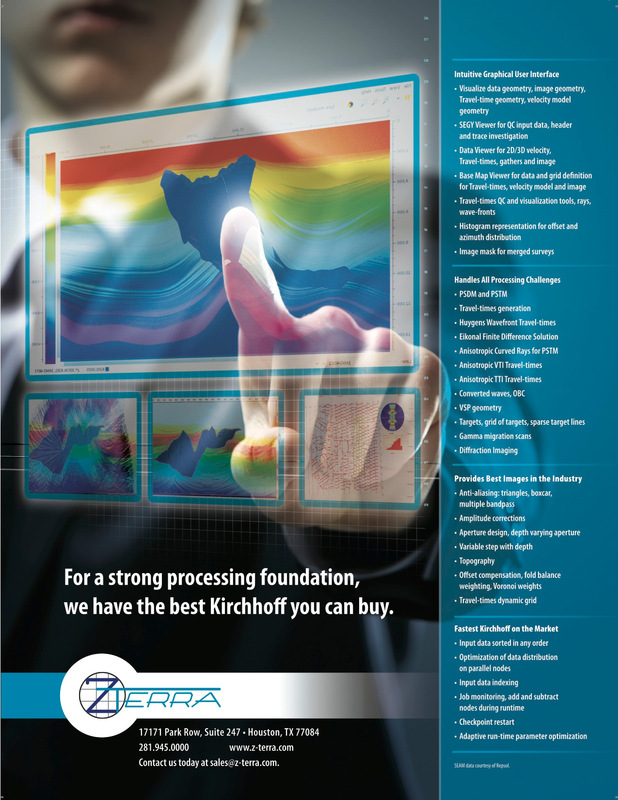 ZTK is Z-Terra’s implementation of three-dimensional Kirchhoff migration in depth and in time. 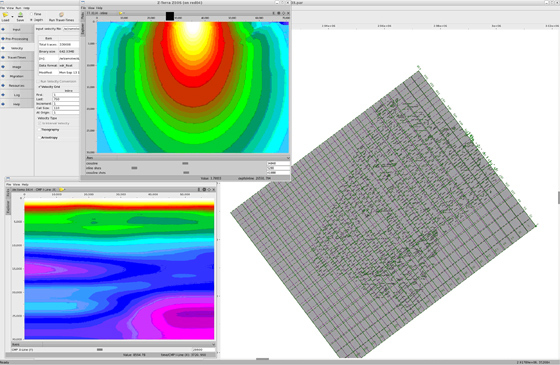 ZTK images seismic data by approximately solving the wave equation with a boundary integral method. The acoustic reflectivity at every subsurface image point is computed by summing the recorded data on multidimensional surfaces; the shape of the summation surfaces and the summation weights are computed from Green’s functions of the single scattering wave propagation experiment. Though the theory behind 3-D Kirchhoff migration is quite straightforward, an efficient implementation of the algorithm poses many challenges, such as input data distribution among the computational units of a distributed system, optimization of network traffic and local data I/O, management of the processing nodes, the ability to add and subtract nodes during runtime, check-pointing, memory management, choice of anti-aliasing method, travel-time interpolation issues, and the effects of aperture and data acquisition geometry on efficiency. 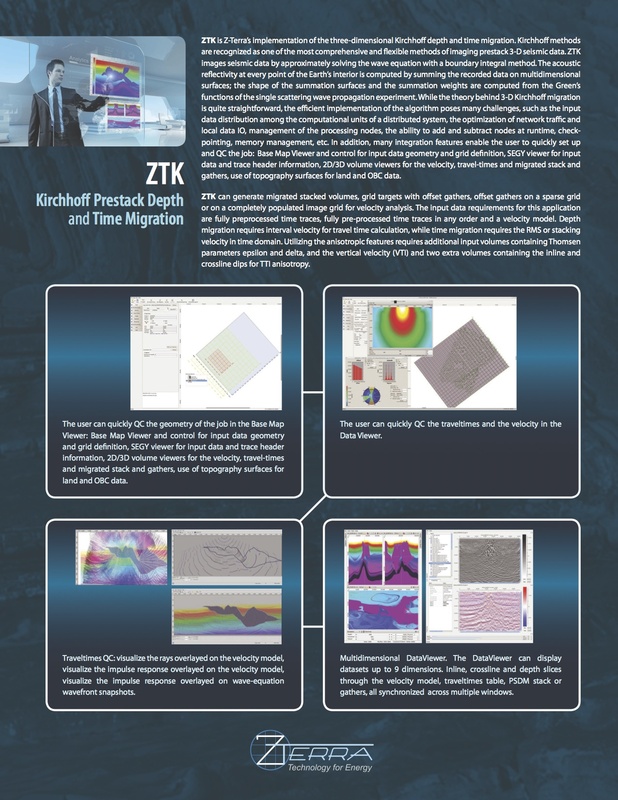 ZTK includes many integration features that enable the user to quickly set up and QC the job: a base map viewer, grid definition and input data geometry controls, a SEG Y viewer for the input data and trace header information, topography specification for land and OBC data, and 2-D and 3-D viewers for the velocity model, travel times, stacks, and gathers. ZTK can generate migrated stacked volumes, grid targets with offset gathers, and offset gathers on a sparse grid or on a completely populated image grid for velocity analysis. The input data requirements for this application are fully preprocessed time traces in shot or CDP order and a velocity model. Depth migration requires an interval velocity model in depth for the travel-time calculation, whereas time migration requires an RMS or stacking velocity model in the time domain. Utilizing the anisotropic features requires additional input volumes containing the Thomsen weak anisotropy parameters epsilon and delta for both VTI and TTI anisotropy and two additional volumes containing the dips of the local axis of symmetry for TTI anisotropy. 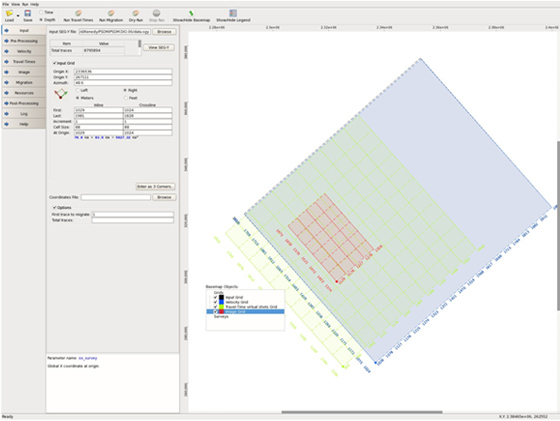 Users can quickly QC the survey geometry and control the input data geometry and grid definition with the base map viewer and view the input data and trace header information, 2-D and 3-D velocity models, travel times, stacks, and gathers with the data viewer. Users can visualize rays overlaid on the velocity model and impulse responses overlaid on the velocity model or on wave-equation wavefront snapshots. The multidimensional data viewer can display and synchronously scroll through up to nine volumes from the same survey. For example, users may synchronously scroll through inline, crossline, and depth sections through the velocity model, travel times, stacks, and gathers.